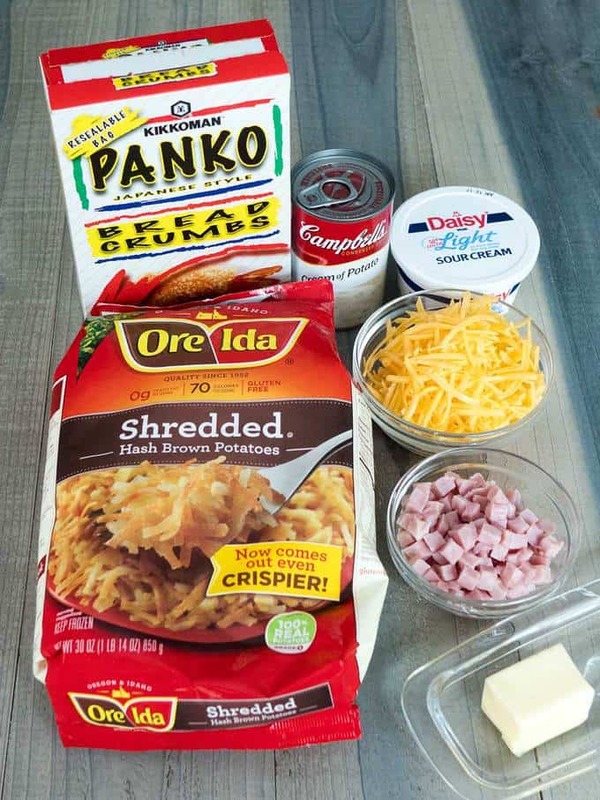 Easy Cheesy Ham and Hash Brown Casserole is a perfect compliment to your Mother’s Day brunch. It’s absolutely delicious as is, but quite versatile in terms of the ingredients that can be added to dress it up. In addition, it can be made ahead of time. If by chance there are any leftovers, they reheat beautifully. Who could ask for more? 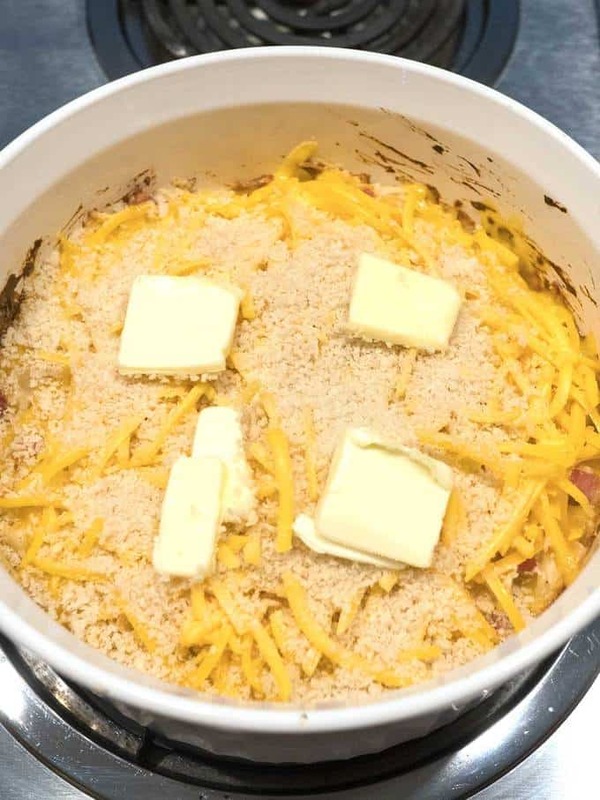 I used the following ingredients: Frozen shredded hash brown potatoes, diced ham, condensed cream of potato soup, sour cream, shredded Cheddar cheese, Panko bread crumbs, and unsalted butter. I started by spreading the frozen hash brown potatoes on a paper towel lined baking sheet. The reason for doing that was to be able to blot excess moisture from the potatoes as they thawed. Otherwise, the casserole has a tendency to be soupy. 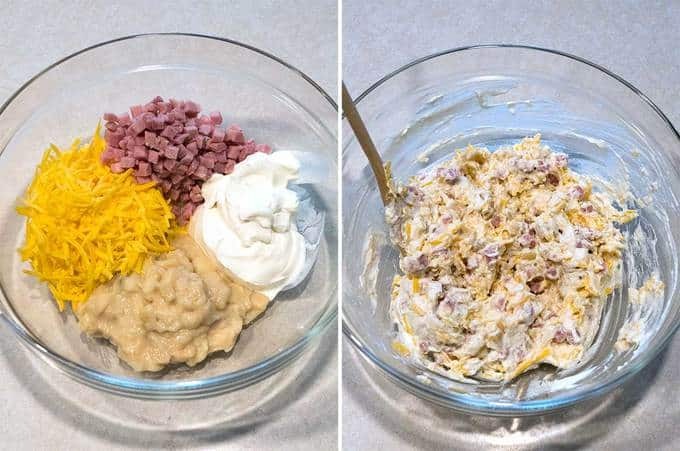 Meanwhile, I added the soup, sour cream, shredded Cheddar cheese, and ham to a large bowl. I used a wooden spoon to mix all of the ingredients. After the hash browns had thawed, I blotted them with a paper towel. Then, I added them to the sauce mixture. I stirred the mixture to ensure that everything was well incorporated, and transferred the mixture to a 2.5 quart casserole dish. I took care not to pack the mixture into the casserole dish, but rather to just smooth out the top. Because I was making this ahead of time, I covered the dish and popped it in the refrigerator. A little more than an hour before I was ready to serve the casserole, I preheated the oven to 375° F. I baked the casserole uncovered for about 45 minutes. Then, I removed it from the oven, and topped it with some additional shredded Cheddar cheese and Panko bread crumbs. I dotted it with butter before returning the casserole to the oven for 15 additional minutes. After 15 minutes, the cheese was perfectly melted, and the Panko was nicely browned. 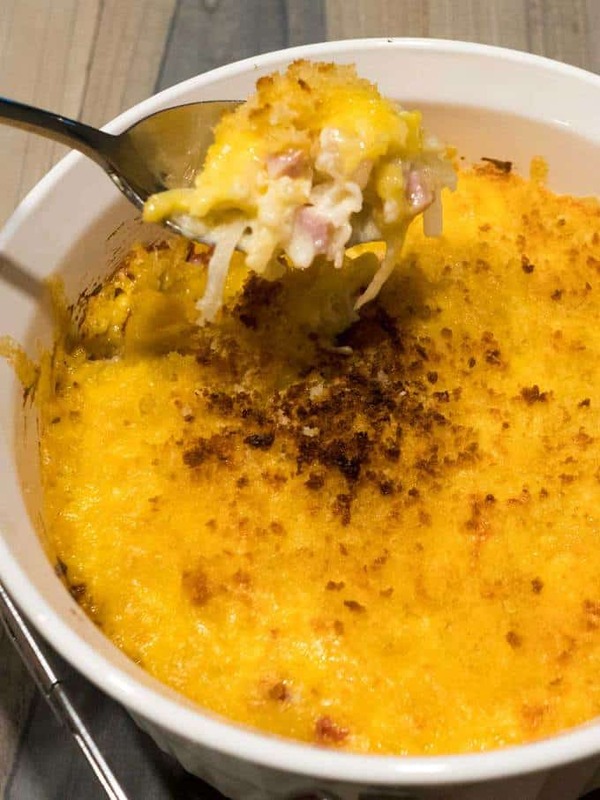 The Easy Cheesy Ham and Hash Brown Casserole was absolutely delicious. I can’t wait to dig into the leftovers. Yum! Preheat oven to 375° F. Lightly grease a dish. 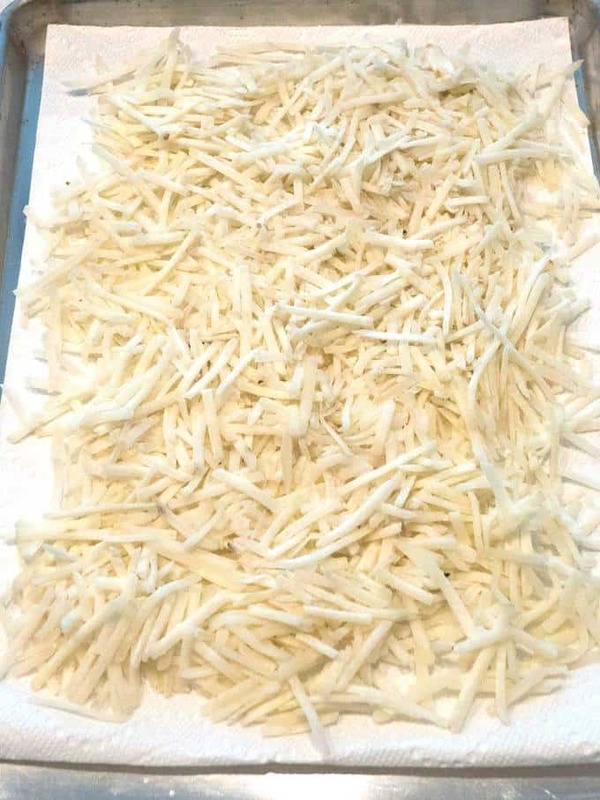 Place frozen hash brown potatoes on paper towel lined baking sheet. Allow to thaw; blot with paper towels to remove excess moisture. 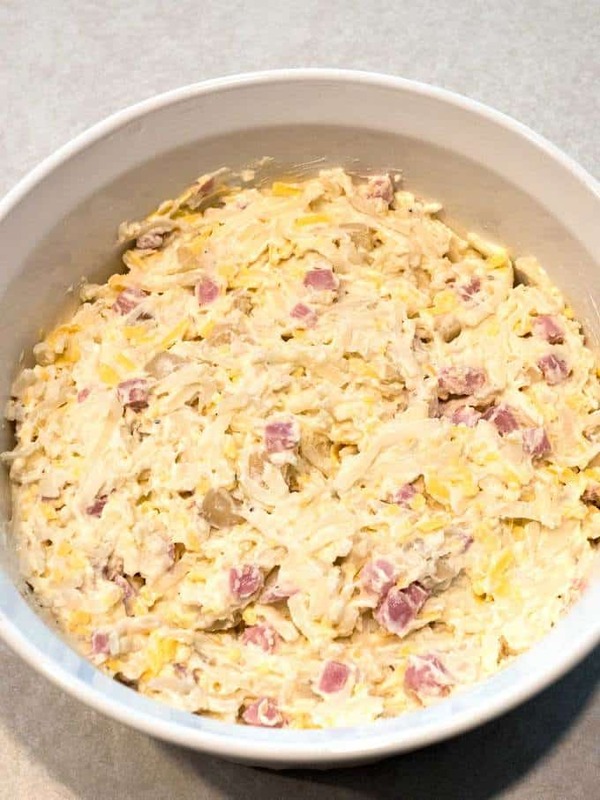 In a large bowl, combine cream of potato soup, sour cream, ham and Cheddar cheese. Add hash brown potatoes; stir to combine. Spread evenly in prepared dish taking care to not pack mixture in dish. May be prepared in advance up to this point, covered and refrigerated. Bake uncovered at 375° F for 45 minutes. 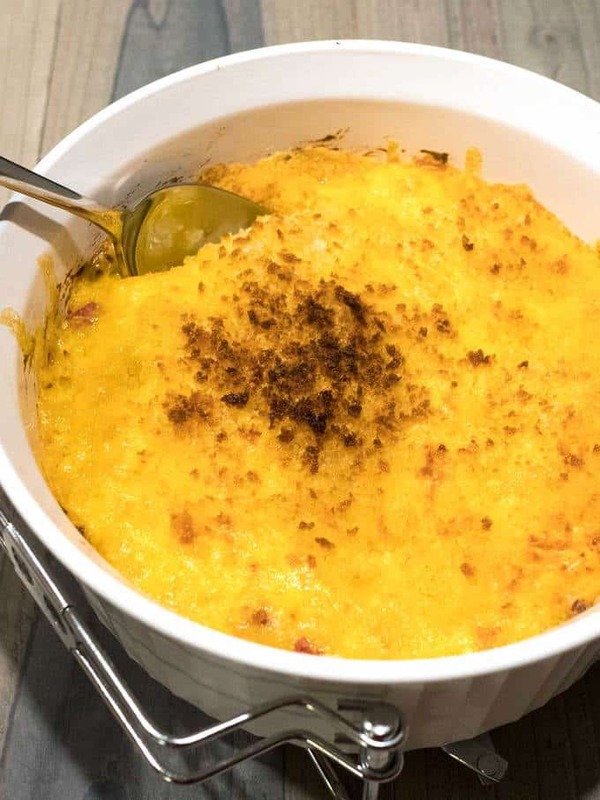 Remove from oven; add remaining 1/2 cup of Cheddar cheese. Sprinkle on Panko bread crumbs; dot with butter. Return to oven for 15 more minutes, or until cheese is melted and top is golden brown.